Tonight, November 5th at 8:00 p.m. the Children's Defense Fund 2015 Beat the Odds Celebration will be held in the Annenberg Theater at the Newseum in Washington, D.C. Award-winning actress and member of the Children’s Defense Fund Board of Directors, Jurnee Smollett-Bell will co-host with Emmy Award-winning journalist Byron Pitts, co-anchor of ABC’s Nightline. 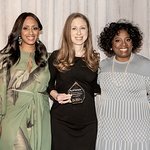 Notable presenters and speakers include Marian Wright Edelman, president of the Children’s Defense Fund; Donna Shalala, president of the Clinton Global Initiative; Rev. Dr. Bernard Richardson, Dean of the Chapel at Howard University; and Romulus Johnson, Beat the Odds alumni from first ceremony 25 years ago in Los Angeles. Five extraordinary high school seniors from the greater metropolitan area of Washington, D.C. will be honored with an award, a $10,000 scholarship, CDF leadership training and a laptop computer. Each one has a story to share of overcoming adversity including poverty to excel academically and give back to the community with the help of at least one caring adult.